Each year the Steering Committee of the Pacific Asia Conference on Knowledge Discovery and Data Mining presents an award for The Most Distinguished Contribution. The purpose of the PAKDD Distinguished Contribution Award is to recognise and honour an individual who has made significant and continued contributions in research and services to the advancement of the PAKDD conferences. 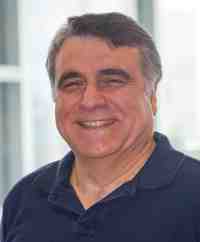 The Steering Committee considers it an honor to award the PAKDD Distinguished Contributions Award for 2018 to Professor Christos Faloutsos, for his many seminal contributions to the field of data mining, including time series matching, network analysis, graph computation, and their scalability. Especially notable is his highly successful program in showing how strong mathematical results can be used to design highly original and novel data mining algorithms. He has also provided tremendous service to raising the visibility of PAKDD conference through publishing multiple high impact papers over the years. The Distinguished Contributions Award is awarded to a member of our community to recognise and honour an individual who has made significant and continued contributions in research and services to the advancement of the PAKDD conferences. The selection committee for 2016 was chaired by Professor David Cheung of the University of Hong Kong and assisted by Professors Kyu-Young Whang of the Korean Advanced Institute of Science & Technology and Chengqi Zhang of the University of Technology Sydney. The 2016 PAKDD Distinguished Contribution is awarded to Professor Zhi-Hua Zhou. The 2013 award for PAKDD Distinguished Contribution was awarded to Professor Jaideep Srivastava of the University of Minnesota, USA. This award recognises significant and ongoing contributions in research and services to the advancement of the PAKDD community and series of conferences. Professor Srivastava has been involved in PAKDD since PAKDD 2006 where he was the conference General Co-Chair. He has been an active supporter, contributing to the steering committee since then and has guided PAKDD administratively, and supported ongoing participation in the conference series. The award also recognises his major research contributions over many years to knowledge discovery and data mining. Congratulations to Professor Srivastava. The 2012 award for Most Distinguished Contribution went to Professor Huan Liu of the Arizona State University, USA. Professor Liu has been involved in PAKDD from its beginnings in Singapore 16 years ago. He has been an active participant and, importantly, has helped guide PAKDD to ensure its ongoing quality and relevance to the international data mining community. The award also recognises his major research contributions over many years to knowledge discovery and data mining. The 2011 award for Most Distinguished Contribution went to Professor Graham Williams, Director and Senior Data Miner of the Australian Taxation Office, and Adjunct Professor, Australian National University, University of Canberra, and Shenzhen Institute of Advanced Technology, Chinese Academy of Sciences. Graham is a key supporter of PAKDD and has made significant contribution to PAKDD since the inauguration of the conference. He has served in many roles in the PAKDD conference series. He has been the Steering Committee Co-Chair and Treasurer since 2001. He was the Organization Committee Chair of PAKDD 1998, Program Co-Chair of PAKDD 2001, Industrial Chair of PAKDD 2004 and the Tutorial Chair of PAKDD 2007. He is also the founder and Steering Committee Co-Chair of the Australasian Data Mining Conference series. Graham has made significant technical contributions with considerable success in the application of data mining technology to real world problems. His pivotal role in deploying data mining in industry was recognised by the Australian Taxation Office with an Innovation Award in 2006 and an Australia Day award in 2007. Graham has published extensively in data mining in many important conferences and journals. He is the author of the immensely popular open source Rattle data mining software and a keen advocate of freely sharing research software. His Internet book Data Mining Desktop Survival Guide is a highly popular tool book for data mining practitioners and this will be published shortly under the title Data Mining with Rattle and R: The Art of Excavating Data for Knowledge Discover, by Springer. The 2010 award for Most Distinguished Contribution went to Professor Masaru Kitsuregawa of the University of Tokyo. Masaru has been very active in his support and contribution to PAKDD over many years. He has served various roles in a number of PAKDD conferences, including as conference chair for 2000, 2009 and 2010, and program co-chair for 2006. He continues to provide guidance as a life member of the PAKDD Steering Committee. He is also a highly respected researcher in data mining and databases. He was a member of the VLDB Trustee during 1996-2002. He served as the co-general chair of IEEE ICDE 2005, held in Tokyo. He is serving as an Asian Coordinator of the IEEE Technical Committee on Data Engineering as well as chair of several well known database and data mining conferences. He is leading a large project named ‘Info-plosion’ in Japan. In 2009 he received the ACM SIGMOD E. F. Codd Innovation Award. The 2009 award for most distinguished contribution went to Professor David Cheung, Head of the Department of Computer Science and Director of the Center for E-Commerce Infrastructure Development, of the University of Hong Kong for his persistent outstanding contributions to PAKDD and eminent academic record. The citation for the award notes that Professor Cheung has been associated with the PAKDD Conference since it inception, serving on the steering committee since 2001 including a period as the chair of the steering committee. He was chair of the program committee of the fifth and ninth PAKDD conferences, in 2001 and 2005 and conference chair of PAKDD 2007. Professor Cheung has actively promoted the conference series in the Asia Pacific region and beyond and continues to encourage his own students and colleagues to contribute to the PAKDD series of conferences. Professor Cheung has a distinguished academic research career, introducing many new students to data mining and pushing forward the boundaries of research in data mining. His publications appear in many highly regarded conferences and journals. He and his students continue to support PAKKD as a conference of choice for presentation of esearch. The 2007 award for most distinguished contribution went to Professor Ramamohanarao Kotagiri, FIEAust, FTSE, FAA, Professor, Department of Computer Science and Software Engineering, The University of Melbourne. Professor Kotagiri has a long and distinguished academic research career. He is well known for his pioneering work on hashing and information retrieval in database management, new techniques for intelligent, efficient and expressive database queries, the theory and practice of emerging patterns, intrusion detection and text mining. His publications have appeared in many highly regarded conferences and journals, including PAKDD, KDD, ICDM and PKDD, and IEEE TKDE, Data Mining and Knowledge Discovery, Machine Learning and Knowledge and Information Systems. He is a member of the Australian Academy of Science and also the Australian Academy of Technological Science and Engineering. He has also served on the Prime Minister’s Science and Engineering Innovation Council.